This story was created in partnership with the Los Angeles Homeless Services Authority (LAHSA). LAHSA was formed in 1993 to streamline responses to homelessness at the county and city levels. The agency conducts outreach and provides a Coordinated Entry System (CES) to connect homeless individuals and families to services, administers federal, state and local funding to over 100 service providers, and conducts an annual count of the number of homeless people across Los Angeles County to track progress and inform solutions in fighting homelessness. This year’s Homeless Count was conducted in January with the help of thousands of community volunteers. According to homelessness counts between 2010 and 2017, the number of homeless people across Los Angeles County went from 38,700 to over 55,000 – an increase of 42%. Many factors contributed to such large increases in homelessness, including Los Angeles County’s housing supply issues. A 2017 report by the California Housing Partnership (CHP) found that median rent in the county has increased by 32% over the past two decades while renter median decreased by 3% (adjusting for inflation) over the same time period. This is particularly significant given that over half of Los Angeles County residents are renters. Furthermore, CHP estimates that LA County needs an additional 568,000 affordable housing units in order to meet the demand of its lowest-income renters. The majority of our homeless neighbors have experienced these income and housing changes in Los Angeles County over the past two decades. The 2018 Homeless Count reports that over 65% of homeless adults have lived in Los Angeles County for over 20 years. Furthermore, almost half of people experiencing homelessness for the first time this year cited loss of employment or financial strain as the primary cause. LAHSA also reports that people experiencing first-time homelessness is on the rise. LAHSA's 2018 Homeless Count reported 52,765 individuals and family members experiencing homelessness (including Long Beach, Pasadena, and Glendale who conduct their own homelessness counts), the first decrease in the homeless population in four years. 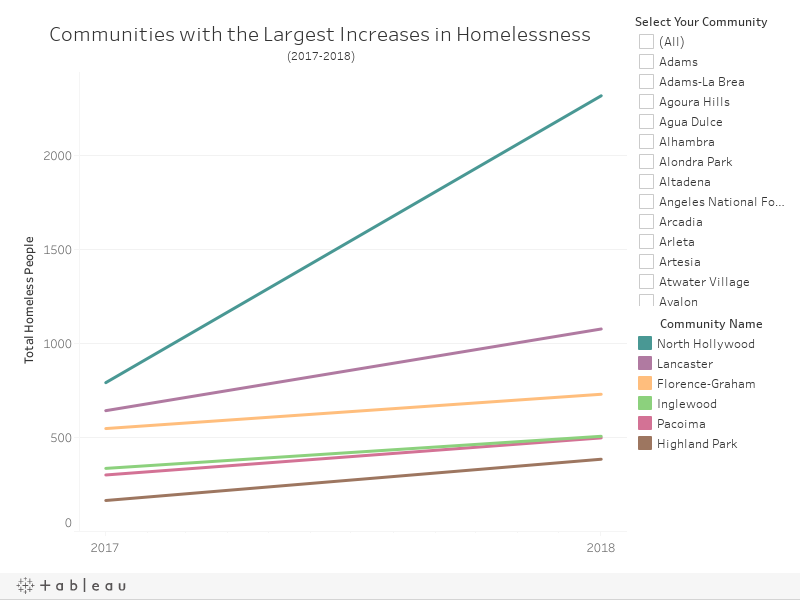 The interactive graphs below compare the five communities that experienced the largest changes in overall homelessness between 2017 and 2018.  To see how your community compares, select it on the menu to the right of either graph. These large changes occurred in a range of neighborhoods spread throughout the county. North Hollywood’s homeless population rose from 791 in 2017 to 2,315 in 2018 - making it the second largest homeless community outside of Downtown Los Angeles. Neighborhoods in the South Los Angeles Region including South Central, South Vermont and Watts experienced significant decreases in total homelessness along with larger unincorporated areas in the Antelope Valley. 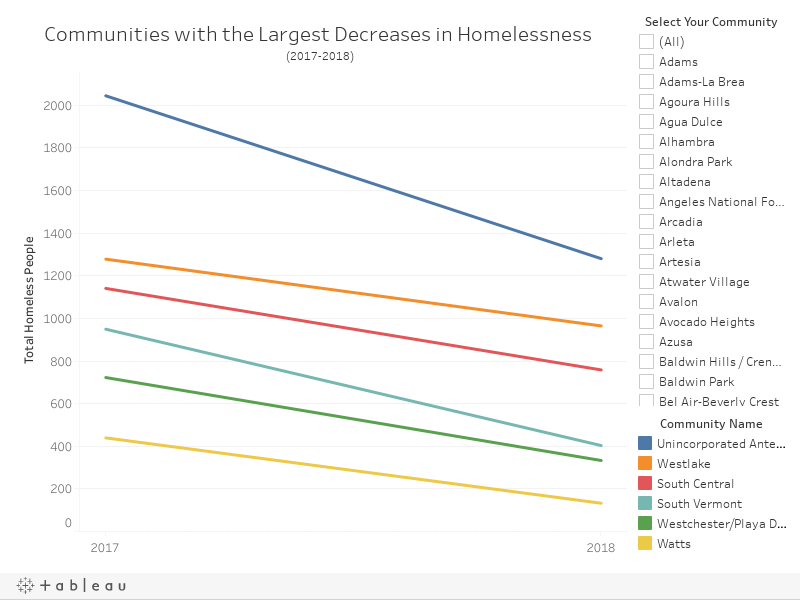 Despite select neighborhood-level increases, the County experienced a 4% decrease in overall homelessness in 2018. Further, LAHSA reported nearly 20% decreases in veteran homelessness and chronic homelessness. LAHSA attributes these reductions to a number of different factors. In November of 2016, residents of the City of Los Angeles approved Proposition HHH to fund permanent supportive housing in the City of Los Angeles. In March of 2017, Los Angeles County voters approved a tax increase to fund $3.5 billion to address homelessness over the next 10 years. The decrease in the homeless population reported by the Homeless Count could be an indication that the recently dispersed funds from these measures are having an immediate impact, as LAHSA reported higher rates of housing placement for homeless people in 2017 than the previous two years. Although overall homelessness is down Countywide, Los Angeles continues to struggle with a high unsheltered homeless population. LAHSA’s 2018 count reports that there are approximately 9,500 people living in tents or encampments across the County. Large encampments are concentrated in relatively fewer communities across the County when compared to other forms of homelessness. However, just because a community does not have large numbers of tents and encampments does not mean that it doesn’t have a sizable unsheltered homeless population. Willowbrook, Wilmington, and Sylmar all contain less than 50 people living in encampments or tents, but well over 250 people living in cars, vans and campers. The figure below shows a side-by-side comparison of the number of people living in tents/encampments and vehicles across the County, highlighting the fact that while encampments may be a commonly-cited form of the homelessness problem in Los Angeles County, many people are experiencing homelessness in less visible ways. LAHSA documented over 15,700 people living in vehicles across the County in 2018. Given this large population and the strict overnight parking laws in most residential areas, the County started a “Safe Parking” program in 2016 to provide safe overnight parking, restrooms, and social service resources to people sleeping in their cars with a valid driver’s license and registration. Because the first few Safe Parking Lots opened earlier this year, the wider-scale impact of the program is yet to be determined. While the findings of LAHSA’s 2018 Homeless Count indicate that we’re moving in the right direction, we must remember that the steps we have taken thus far are small compared to the work ahead. Despite containing only 3% of the total U.S. population, Los Angeles County still holds nearly 10% of the country’s homeless population. People around the world are looking to Los Angeles for compassionate leadership and innovation in solving this human rights crisis. The 2019 Homeless Count will be held January 22, 23 & 24, 2019. Visit https://www.theycountwillyou.org/ to learn more and sign up to volunteer. Note: The communities shown throughout this story are those defined by LAHSA and may have different boundaries than those shown in other Los Angeles NDSC Data Stories. Story updated (August 6, 2018): Originally said, "LAHSA’s 2018 Homeless Count reported 52,765 individuals and family members experiencing homelessness (including Long Beach, Pasadena, and Glendale who conduct their own homelessness counts), the first decrease in the homeless population in nearly a decade."